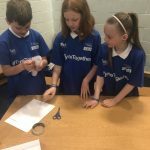 Year 5 winning Tyne Together Team enjoyed their morning at the finals. Our Year 6 DigiLadies enjoyed a project day with Laura Dickinson from North Tyneside Learning Trust. 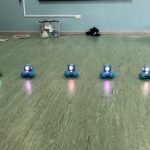 Their first project was to code the Spheros to create some sphero art. In the afternoon they coded the chorus to a song ready to have a Dash Dance Off. 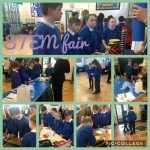 Some Year 5 children attend a STEM fair this afternoon. 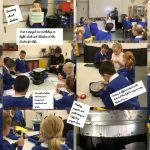 We learnt lots about careers in STEM and what the jobs involve. Year 5 have been learning all about Earth and Space in Science. 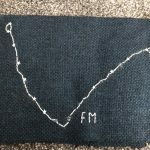 After a visit to the Planetarium at the Centre for Life, they were inspired to create star constellations using back stitch. Their work has turned out great. Year 5 enjoyed a visit to the Life Centre to experience the Planetarium and learn a little more about the solar system and stars. 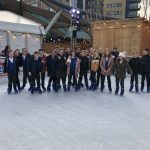 Ice skating was very entertaining to watch! 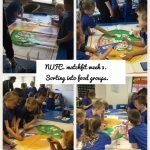 Year 3 are exploring the different food groups with matchfit. Year 3 loved their educational visit to the Centre for Life. We discovered lots of things about light, dark and shadow. Year 5 have been learning all about Maria Sibylla Merian who was an entomologist who loved bugs. She was a fantastic artist who had great attention to detail of the flowers and bugs she painted. 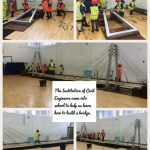 The children have also enjoyed building a huge bridge with ICE Bridges. They have been amazing engineers this week and throughly enjoyed STEAM 2018. 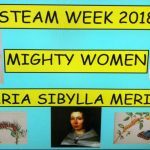 STEAM week – Fossil Fun! Nursery Children have had a super week learning about the work of Mary Anning; a palaeontologist famous for her fossil collections and contributions to scientific knowledge of the prehistoric world. 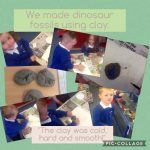 Learning about dinosaurs, making dinosaur hats and singing songs about dinosaurs, are just some of the exciting activities they have done this week. Take a look at their fossils made out of clay! All agreed that clay was a bit like playdough but it felt cold! We had great fun learning how to build a bridge today.